← VOTE NOW! for our Aviva Community Fund idea in support of Camp Wa-Thik-Ane! This post originally appeared on the blog Everything But the Kid. Thank you Amy for allowing us to share this with our audience! For years I have volunteered in some capacity or another with various groups and I love it. From racing to the Cancer Society and beyond, I love helping others plain and simple. For me, I can’t always afford to donate to things in a monetary capacity, but I can and do donate my time where I can. I admit I did feel burnt out with volunteering a few years ago (I overdid it slightly) and had to step back and re-evaluate how to best help out. But now I’m re-energized and re-focused so this year my big volunteer project is a very non-mom themed one. Early in the year my darling wonderful BFF Jackie (who knows how much I love to craft) told me her daughter was enrolled in Sparks and invited me out to check it out and help out. I got hooked immediately. I freely admit there are MANY MANY MANY a moment when this non-mom wishes she had one of her own, so any time I get to spend with kids I cherish and so enjoy. Jackie laughs I’m sure at how I light up when I see her kids and so do my other friends when I see theirs too. I love munchkin time. I started the paperwork process as quick as I could to get cleared and signed up to be a Sparks leader this year and I swear it’s one of my best decisions ever. I beyond look forward to the meetings and while intimidated slightly at the beginning, I’m slowly settling into a routine with the girls and the meetings. I get to help the girls learn and grow in positive ways and in a program that I myself went through and believe strongly in. If I had a daughter, believe me, they’d be in the program. I get to give back to the community and some amazing girls, and in return I get to smile and indeed, as my leader name indicates: Sparkle! Do you volunteer? What has been your favourite or most rewarding volunteering experience? By guest blogger Amy of the 15th Oakville Sparks. This post originally appeared on Amy’s own blog Everything But the Kid. Thank you Amy for allowing us to share this with our audience! 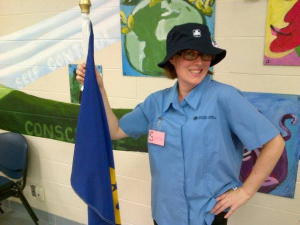 This entry was posted in Girls' Guides and tagged female role models, sparks, volunteer. Bookmark the permalink. 1 Response to Giving Back with Sparks and Sparkles! The majority of the people I volunteer with have children in guiding as well. So from one non-mom to another thank you for sharing!